Maintaining East Hampton Town’s viability means facing issues including rising sea levels, traffic congestion and workforce housing shortages, a series of reports find. 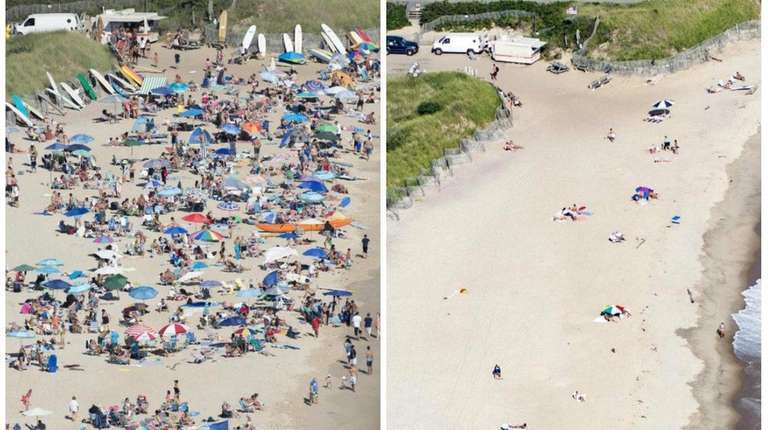 Maintaining East Hampton Town’s status as a prized vacation destination well into the future will require detailed planning, strategic development and, with rising sea levels, moving Montauk businesses back from the beach, a new series of studies concludes. Reports on the town’s five hamlets, conducted by Massachusetts–based planning consultants Dodson & Flinker, includes recommendations such as zoning and traffic flow changes that could be implemented in the near future. Other, more involved initiatives, such as the Montauk waterfront business “strategic retreat” plan, could take years to complete. The Montauk recommendation calls for a new resort/mixed use corridor along Essex Street and a shift of the downtown center inland toward the intersection with Montauk Highway, which is at a higher elevation. Montauk’s wide beaches, laid-back atmosphere and oceanfront motels long have been a draw for vacationers. But the hamlet has shifted in the past few years toward more upscale boutiques and high-end restaurants that draw wealthy tourists and second-home owners to the lively downtown, the only one of the East End downtowns that sits on the ocean shore. The report does not identify specific Montauk businesses that would need to move farther inland, but a map of areas prone to flooding includes properties along South Emerson Avenue, a stretch that features several motels. 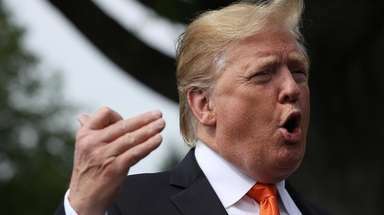 It also would require negotiations with owners of low-lying businesses, perhaps through a plan to transfer their development rights, the report suggests. 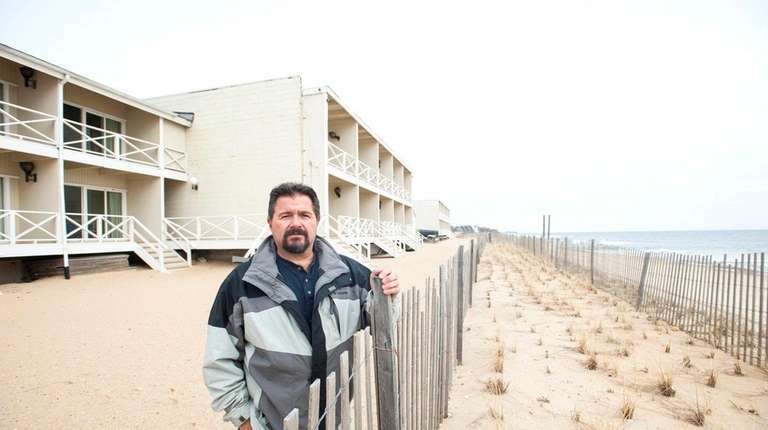 Royal Atlantic Beach Resort owner Steve Kalimnios wondered how he could relocate his oceanfront hotel, which he said accommodates thousands of guests a year and has been owned by his family for four decades. “Where is it going to go?” he said. Monte and Kalimnios said the town should first look to bringing in sand for beach nourishment projects before considering moving businesses. Erosion is a continuing and controversial issue in Montauk. After superstorm Sandy, the Army Corps of Engineers developed a plan to bury 14,000 huge sandbags to stabilize the beach, but was met with widespread community opposition. The hamlet studies’ overall goal is to find ways to boost business districts in Wainscott, East Hampton, Amagansett, Springs and Montauk. “This is really to enhance the viability of our businesses within our downtown areas,” said Councilwoman Sylvia Overby, the town board liaison on the project. Another recommendation in the report, which was unveiled Tuesday during a town board work session, is the creation of a Wainscott “home improvement” district where contractors could get their supplies in one area to separate them from the restaurants and stores that make up a typical walkable downtown. The report recommends the town then encourage existing business to move to the district, which would create new opportunities for development in the hamlet’s downtown. In the East End’s longtime summer battle to minimize traffic congestion, the report recommends shopping centers be connected with adjoining parking lots and pedestrian plazas to keep traffic off Montauk Highway. It also suggests encouraging second-story units in commercial areas to create workforce housing. In Springs, the consultants recommend creating a “maritime walking district” linking the Paumanok Path hiking trail with the head of Three Mile Harbor. Overall recommendations also included more detailed zoning that would require new development to conform to the look of the community and implementing better wastewater treatment systems. The study will still require an environmental review and a public hearing before it could be adopted by the town board and incorporated into the town’s comprehensive plan. Copies of the studies for each hamlet are available on the town’s website, ehamptonny.gov. How LI could be affected by rising sea levelsNew York State's Department of Environmental Conservation estimates that by the 2050s, levels on Long Island's coast could be between eight to 30 inches higher. 11 inns and B&Bs on LI's South ForkMost beach resorts are bursting with hotel rooms, but the Hamptons are not most beach ... Montauk's best-kept secretsWith a history that dates to the very beginnings of the United States, there is quite a story to tell.